Youthful, sporty and versatile in pristine white, these leather sneakers from Axel Arigato are a luxe choice with plenty of styling potential. Finished with trims of velvet-soft suede and styled with a classic lace-up front, wear them next to cuffed denim or smart tailoring for effortless cool. You can never really have too many pairs of shoes, right? 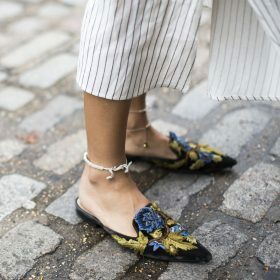 If you are looking to expand your collection even further, you have to consider adding at least one pair of flat shoes. Great for almost every occasion, flat shoes can be work for going out for dinner, and office even or even a formal event. From outdoor flats to more casual shoes, there is something for everyone in our flat shoes category. Use the filters to find the right size and color for you.